We do new development and sampling for our customers. New Development and creating new sample for customers require lot of research on sourcing best quality fabrics, matching designs, pattern cutting and adjustments, buying Accessories like beads, tassels, crystals. We have to buy them in lot and there is lot of handwork, time involved. So when we make initial samples the cost involved is high so we charge 1.5 of production price. For Example. 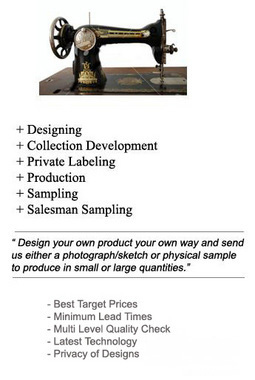 If the product production price is 1 USD we will charge you 1.5 USD For Sampling. Please provide us the art work if you can. Fabric to be used – if possible you can send us a swatch we will try to source the same material. Send us your company standard sizes. Anything else we require we will contact you. We require advance payment for all sampling requirement.